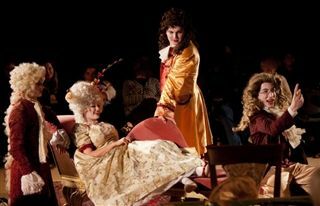 Seventeenth-century farce met modern banter and timeless humor during the April 24th and 25th performances of The School For Lies. David Ives' renowned comedy, inspired by Molière's The Misanthrope, relies on rapid repartee to tell the tale of sharp-tongued widow Celimene, who has kept suitors at bay with her acidic wit, until she finally meets her match. The cast proved game for the challenge of Ives' demanding dialogue - delivering tongue-twisting verse with ease, delight, and a sense of playfulness that proved contagious to everyone in attendance.